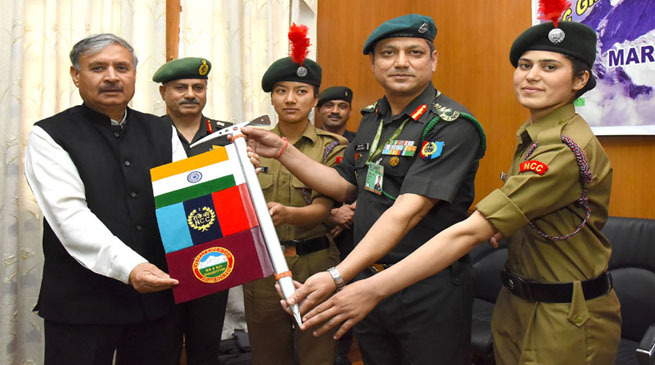 The Minister of State for Defence Rao Inderjit Singh Flagged off the first ever all girls National Cadet Corps (NCC) Mount Everest expedition, here today. The team led by Col Gaurav Karki, along with fifteen service personnel and ten girl cadets would reach Nepal on 31 March 2016 and after a long trek to Base Camp from 08 to 25 April 2016 is likely to summit the peak between 15 and 25 May 2016. Director General NCC Lt. Gen. A. Chakravarty had proposed the conduct of first ever NCC Girls Expedition to Mt Everest in 2014. All India trials at 25 selected hubs were carried out and 100 girl cadets were nominated to undergo the Customised Mountaineering Course at Himalayan Mountaineering Institute (HMI), Darjeeling from 07 Jan – 03 Feb 2015. Based on their performance, 40 girl cadets were selected for the first Pre-Everest Expedition. Pre-Everest Expedition to Mt Deo-Tibba (19688 Feet), near Manali in Himachal Pradesh was conducted for 40 cadets in Apr-May 2015. 15 cadets were selected for the next phase based on their performance. In Aug 2015, the team set off on the second Pre-Everest Expedition to Mt Trishul (23360 Feet), and helped in selecting 10 girl cadets for Everest Expedition. The culmination of Pre-Expedition activities was winter training at Siachen Base Camp from 11 Jan to 31 Jan 2016. The training camps exposed the team to extreme cold conditions and further refined ice craft skills. The aim of mountaineering expeditions in NCC is to strengthen the character and instill qualities of courage, comradeship, discipline and leadership in the cadets. The first mountaineering course for NCC Cadets was conducted for 42 days at Himalayan Mountaineering Institute (HMI), Darjeeling in 1961. Every year, NCC sponsors 354 boy and girl cadets for basic mountaineering courses at HMI, Darjeeling, NIM Uttarkashi, ABVIMAS Manali and Jawahar Institute of Mountaineering and Winter Sports (JIM & WS), Pahalgam.